If you search the keywords “floating village, floating village Cambodia” on Google, you will realize that the floating villages in Cambodia are also a good idea for your next trip. 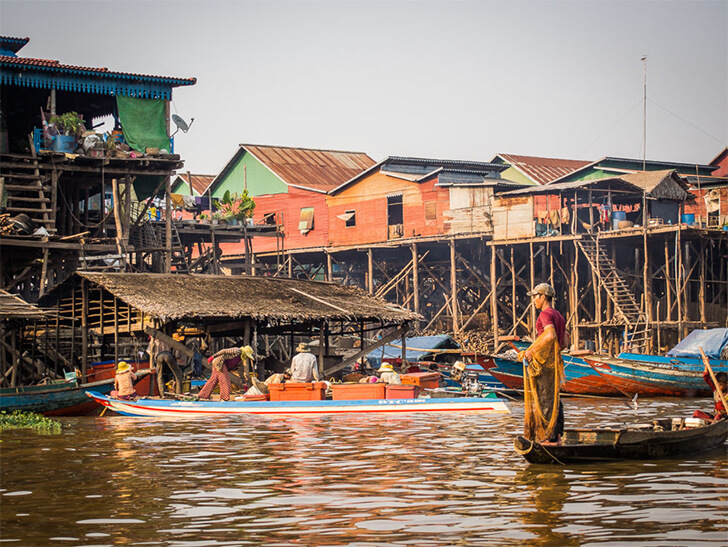 When you have the opportunity to visit Tonle Sap Lake, do not miss the opportunity to explore the unique and peaceful floating villages here. This is also a great opportunity for the cultural researcher to study and find something interesting. 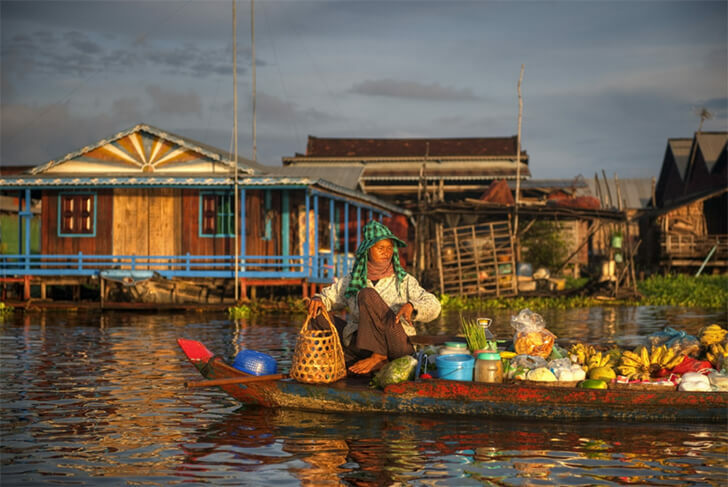 In this article, we will introduce to you “Top 3 most famous floating villages in Cambodia”. 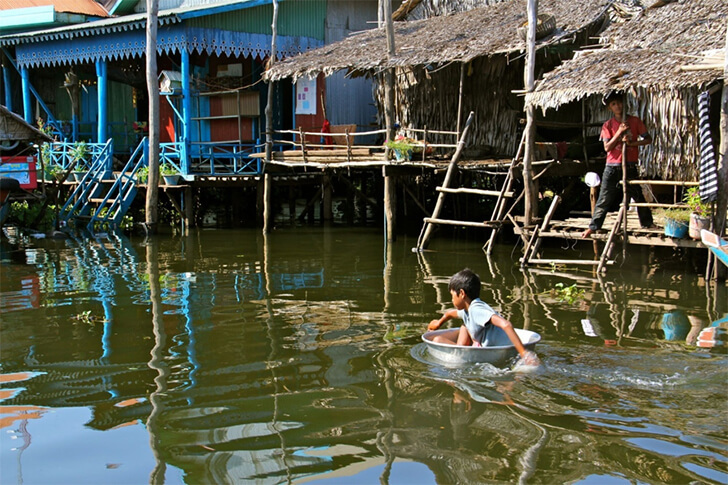 Visitors can visit Kompong Khleang floating village to experience the Cambodian people's life with floating houses. Kompong Khleang, 55 km from Siem Reap to the west, is the largest and most remote village on the Tonle Sap Lake, the UNESCO-protected biosphere reserve. It provides over half of the fish stock in Cambodia. However, the life here is not easy. The difference in water level on seasons is so big that this place is known as “the heartbeat of Cambodia”. In the dry season, the Tonle Sap water flows into the Mekong River. In the rainy season, the lake water rises up to 12 m and its area extends over 20,000 km 2 - 5 times more than the dry season. 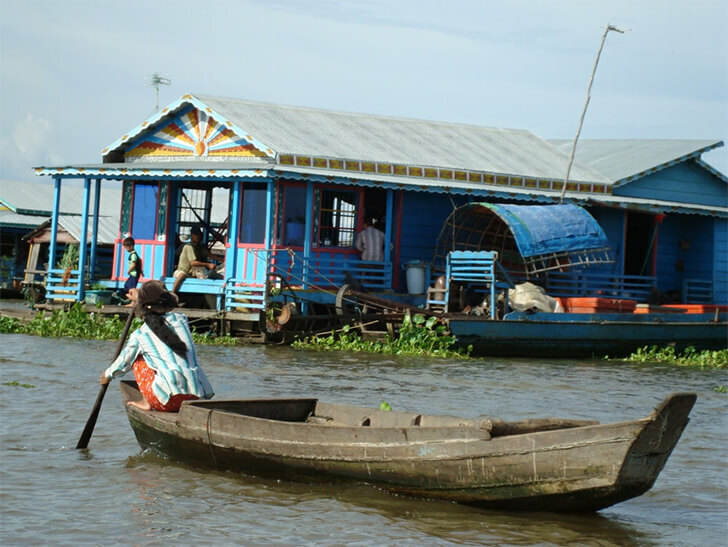 Therefore, the local people face both physical and economic challenges with the tough conditions by the fragile floating houses. Most of the houses in this floating village are bamboo tents with only one room. During the dry season, the house is standing on the bamboo piles stuck to the bottom of the lake. Residents enter their house with a long wooden ladder. 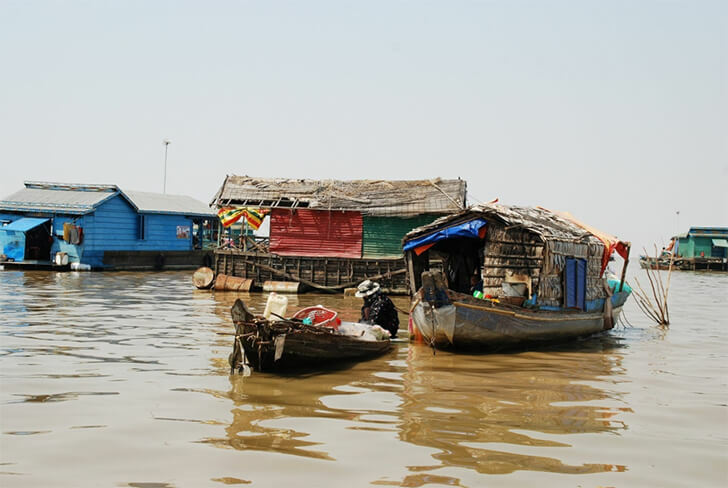 Whenever there is the flood, people can only use wooden boats moving around Kompong Khleang, between the stilt houses, schools and medical facilities, even the pagoda on the stilt houses. When the children in the village know how to row, they have to go to school and go home by themselves. The lake is their playground, jumping from boat to boat, hiding in the long boat of the family. The houses which are not built on piles are designed to float on the river surface when the water rises. The floating houses are made of bamboo, wood, smaller than the house on stilts. They are quite safe when the water is low but the strong tide in the rainy season is too precarious. Many houses have small motors but most of them float freely and change positions when the water recedes. More than 3 million people live on the shores of the lake and 90% of them make a living from the fishery or agriculture. Kampong Phluk consists of three small villages floating on the water. 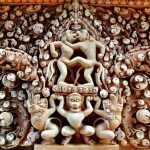 This village which is located about 16 km from Siem Reap is one of the interesting tourist destinations in Cambodia. You may take up to 30 minutes to arrive here and there are many boats waiting to welcome visitors. The boat trips to the floating village usually last about two hours and you will have the opportunity to explore the floating houses of the Khmer, Vietnamese and Muslims along with the floating market of fresh seafood, the school, and the clinic. In the rainy season, the water level of Tonle Sap Lake is very high, nearly up to the ticket office and the tourists just take some steps to jump on the boat. At that time, the giant water flows from Mekong River run into Tonle Sap, bringing a huge amount of alluvial. On the dry season, the alluvial deposits on the surface and makes the land fertile and suitable for growing rice. In the noisy sound of the engine, the boat runs along the winding river branches to the floating village of Kampong Phluk, about 3km away. Unlike normal, the fishing season of the people here is in the dry season, when the Tonle Sap water level is at the lowest level because, at that time, the large fish population will swim along the water from the Mekong River into the lake. Besides, when the water level is down rapidly, the fish are trapped in the lake so it is easy for the fishermen to catch the fish. It is considered as a “gold mine” of local people in Kampong Phluk. 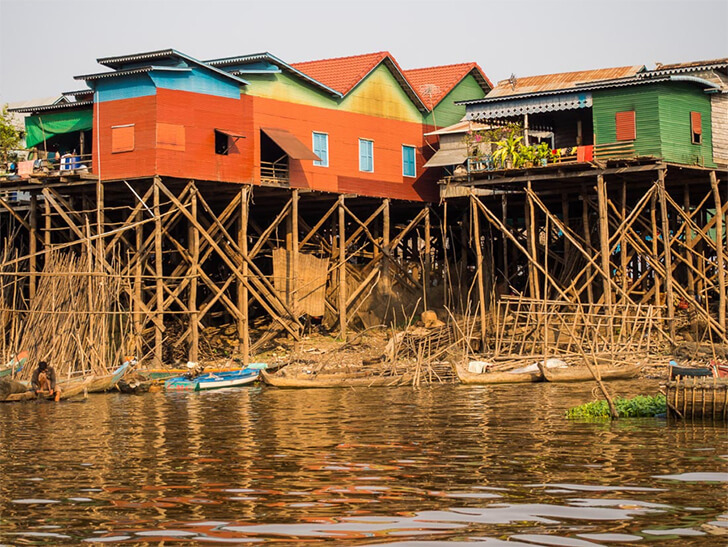 The houses in Kampong Phluk were built about 6-10 meters from the river’s bottom to avoid the floating season in the Tonle Sap Lake, Cambodia. The people live here mainly by fishing and earn more income from tourism. Around the village are the mangrove forests, indigo forests with the trees growing close in the water. Visitors can visit Kampong Phluk by small boats. The cost per passenger for the boat ride in two hours is about $6 to $8. Here, the houses are built close together. In the dry season, the water level is down making many houses on the high land become ordinary like other houses. In the rainy season, the water is up and the houses of local people in Kompong Phluk float on the river. The major means of transportation in the floating village are boats and canoes. Around the village are wetland forests. Tourists, especially Western tourists, prefer to sail through mangroves and melaleuca forests. People here partly depend on the tourism. Leaving Chong Kneas wharf in the northwest and northwest, after nearly two hours, the tourists will approach a small floating village known as Kbal Taol or Ba To fishing village, located in the middle of the Tonle Sap, Cambodia. Looking out a far distance, you only see the skyline though it's a sunny or cloudy day. Most of the people in Kbal Taol floating village, Battambang province, Cambodia are Vietnamese descents in the southwestern provinces. Their families have come here decades ago. The life of the people is extremely difficult and there are many "NOs": no electricity, no clean water, no road, no school and no clinic. The daily life is completely depended on the natural conditions. The fishing village is located in KaohChiveang, Aek Phnom district, Battambang province, but it's just an administrative place because, in the side of Battambang, the road is very difficult to move (very muddy and far from the highway). Therefore, if you want to go to this fishing village, follow the road in Siem Reap province and then get to the waterway. Now, the village has 259 families with more than 800 people. Most of them are Vietnamese descendants in the southwestern provinces and their main occupation is fishing. Coming to this area surely will provide you the full picture of its poor but hard working residents. That might call for your sympathy and make you treasure your life even more. Those are new experiences that you should not miss. Due to the competition in fishing in other areas, people do not move to other places and still live there for generations. This place is also near the fish pond, so it is easy to work for life. In addition, the local authorities do not manage too tightly, so the villages and residents are often gathered here. The classes for children are very simple and deserted but there are a lot of students coming here. Previously, the Protestant organization opened a free class for the children of the fishing village. In fact, the teacher was not qualified so Grade 5 students did not know the arithmetic as well as the basic knowledge of Grade 1, Grade 2 under the universal education program. They mainly preached evangelical catechism. Aware of these difficulties, the local people have borrowed the government of a floating house, organizing the classes for their children to study. Recently, the house was withdrawn and the local people have to contribute to repair the house for their community activities to continue to maintain the learning of their children. There are about 120 children from 1st to 5th grade. Their learning conditions are very difficult: no tables, no chairs, no schooling tools and other equipment, but they still like studying. It is difficult to describe all the difficulties and hardships of the people here, but we believe that if the community joins hands, in the near future, this floating village will be matched with other ones as the aspirations of local people.